When it comes to hiring an outside service company, self-storage operators must weigh the pros and cons. All too often, misconceptions get in the way of making informed decisions. Whether it’s hiring a management company to oversee day-to-day operation, a pest-control provider or even a call center, it’s critical to separate the myths from the facts. 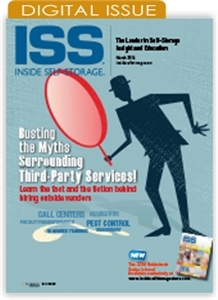 This issue of ISS takes looks at hiring third-party services, exposing the misconceptions operators may have about outsourcing.